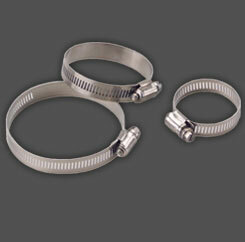 IDEAL® is your manufacturing source for on time, quality hose clamps and specialty clamps. IDEAL® manufactures a broad line of standard worm drive and specialty hose clamps designed to satisfy a wide range of fastening applications and configurations. Our mechanical design locks the one-piece housing directly to the band, using the full strength of the material to provide maximum anti-shear protection. There are no spot welds to rupture under stress or corrosion.